WELCOME RETURN: Kane Williamson is back at Headingley for Yorkshire. I HAVE to say it’s been great to welcome back a familiar face to the club this week in the shape of Kane Williamson. 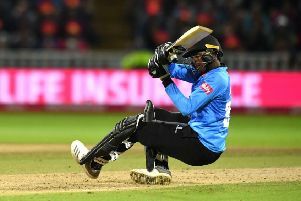 We would love to have him back for more than six weeks but that is just the way of the world at the minute with signing overseas players – it is very difficult to have them in for long periods because of the demands of the international schedule. Yorkshire's Ryan Sidebottom is one of a number of key players out injured at the moment. The first time I saw Kane was when we played Gloucester back in 2012 when we were in the Second Division and he batted really, really well and I remember the umpire, Richard Kettleborough, saying at the time that he had umpired in an international between New Zealand and South Africa and he said he was an outstanding batsman. We had a really good attack out that day. I remember Bres’ was bowling when he was really at his peak and playing for England and Kane just played him so well – you could just tell he was going to be a star. He’s a pretty laid-back guy generally and just gets on with his business and keeps himself to himself – but he has that steely focus about him as well and you can see that in his eyes. It does not surprise me the way that he has moved on in international cricket and it’s obvious why he is among the top two or three batsmen in the world. He’s very much like Rooty in that you can’t really tell the difference whether they’ve been successful or whether they have failed with the bat because they remain the same level-headed guys throughout. Kane just brings a calmness and a steeliness whenever he’s around and when we picked him up he wasn’t a massive name, but you just could tell he meant business. It probably was a little bit out of the box when we brought him over and while we might not be able to get him for as long nowadays, any opportunity we have to get him in we will do, even if it is only for a short period. He’s going to be straight into the one-day stuff for us which won’t be a problem because he’s strong in all three formats of the game. He’s captain of New Zealand across the board so he will bring a lot of experience and leadership in with him. Things haven’t gone to plan so far in the one-day stuff and, having spoken to the lads, I know they are gutted. It is early days, though, and you can soon go on a bit of a run. When we got to the T20 finals day back in 2012 we had a run of winning eight games straight so they have to believe they can do that. It’s quite strange for me at the minute in a way because I was told I wasn’t going to play in the T20. I’ve played over 100 games in T20 cricket and I’m the leading run-scorer for the club in the format so it was quite weird watching the lads go into the competition and not be involved. But it’s something that I’m still passionate about and I still want to play and get in the fold, so I’m hoping I can put my name in the hat later this week. I’ve not been in contention anyway for the past few days because of an injury. I had an injection last Friday on my wrist, but I’m hopeful that I can be available in a few days to get picked again. If not, I’ll play for the 2nd XI in preparation for the Championship game the following Monday at Durham. We are being tested at the minute, there’s no doubt about that. I only said to Jason the other day that if we did win the Championship this year, we will be very deserved winners given the injuries that we’ve had, but I guess we’ve been lucky over the last few years in us not having a lot of injuries together in one go. At the minute, though, Jack Brooks, Matthew Fisher and, of course, Ryan Sidebottom are all out so it’s left us a bit thin on the ground bowling-wise. At the start of the season we were talking about how we’re going to have to manage seven seamers into four spots but as it has turned out, we’ve had to go and bring in other options. It is a testament to the club’s resources and our policy that we’ve been able to cope. You look back to the start of last season when we were missing six key players on international duty – we really had to dig deep and we’re having to do that once again. We just have to make sure that we stay in the hunt and if we can do that and get the lads back for the second half of the season then I know we will really put our foot down hard on the accelerator. One of the most encouraging things for me is that we’ve still got a lot left in the tank. We haven’t actually played that well. So to say that we are joint top while playing some average cricket is a real positive for me.